The blackbird came rarely, and when it came, it brought death in its wake. No-one knew why. It was just a bird, and acted no differently to its feathered kin. But time and again this one returned, and every time, someone in our family died. My mother called it a psychopomp. For many years I thought that sounded like something that came once every two or three years when the carnival came. But unless a death coincided with that, then their performances passed in colour, vibrancy and without incident. I have decided, over the years, it is one of our kin, come to take us home. My great-grandmother on my mother’s side was said to be a witch. Even further back in our family tree we claim connections to Salem and all the mystery of that place. 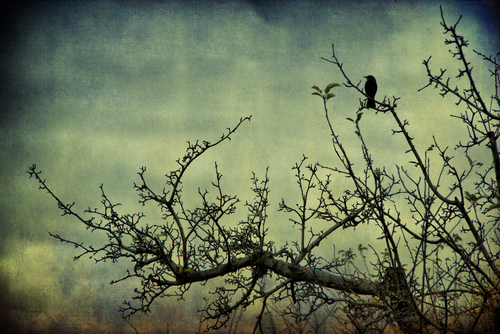 I think the blackbird is of that line and I think it is a friendly creature, no matter how dark its message. I think that even now, as I gaze out my window from my sick-bed and see it settle once more in nearby trees. I have been very ill now for sometime, though they will not tell me the prognosis. My parents come and go from the room, speaking in hushed tones, mopping my fevered brow. This morning my mother was singing to me when she, too, looked out the window, to see the blackbird. It stilled her song and she wept. “I do not understand,” my mother said, her head dropped down so close to her chest I could barely hear her. This entry was posted in Horror Flash Fiction and tagged blackbird, dark, death, family, flash fiction, grief, Horror, kin, loss, psychopomp, Salem, witches. Bookmark the permalink.